In the Lord, we dwell in safety! June 27, 2015 12:01 am / 2 Comments on In the Lord, we dwell in safety! To announce or not to announce? That has been the debate recently. If we announce, we run the risk of “chasing” people away (prospective staff and mission teams) or “worrying” friends and family back home. If we don’t announce, we aren’t giving our supporters the truth about what is going on and the struggles we are facing, and we are not availing ourselves to the many prayer warriors that can be joining us in prayer. We have opted to announce! 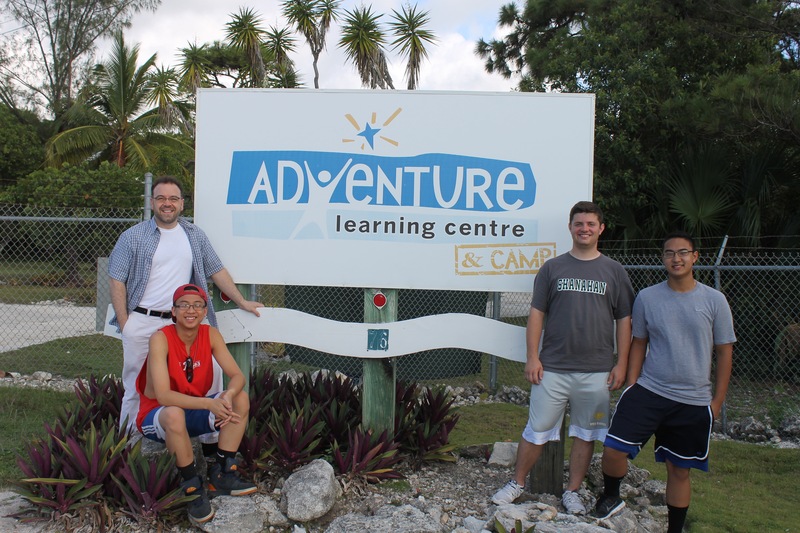 In the last 8 months, Adventure Learning Camp has been robbed 6 times. All but two of the instances happened in broad daylight. Staff have lost a computer, a car, small amounts of cash, purses, jewlery, etc; the Camp has lost tools and equipment; Mission Discovery lost tools and electrical equipment; but despite the loss of property and the inconvenience of having to deal with the lost property and damages, we feel blessed that “things” are all that God has allowed the thieves to take. We remain at peace in the knowledge that God is in control and protecting us. We will not allow Satan to scare, threaten or intimidate us! Praise God with us that the car was recovered this week, we are safe, and that the police have found the perpetrators of this last break-in. 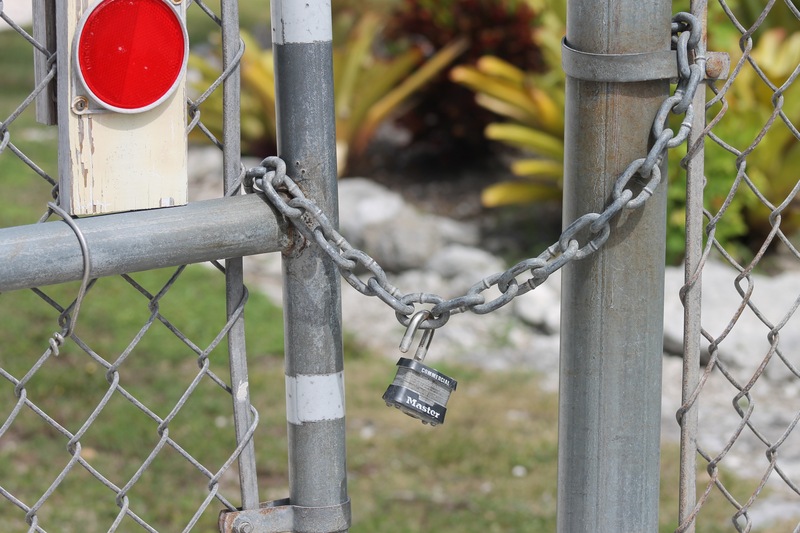 Please continue to pray for safety and protection of the staff, guests and property of all here at ALC&C and that God gives us the opportunity to extend grace to the thieves (we know who it is) and that the thieves will repent and come to know the Lord. Once again we would like to thank all the the teams that have come to the island this month to serve the Bahamian people. We feel honored to have been able to meet each of you, serve you and serve along side each of you as we have labored to further the kingdom of God on this earth. We were not able to meet the team that came to serve through Mission Discovery the first week of June because we were in the States for Garrett and Abby’s wedding. Our capable staff served the MD team and staff well, and we heard great things from MD leaders. 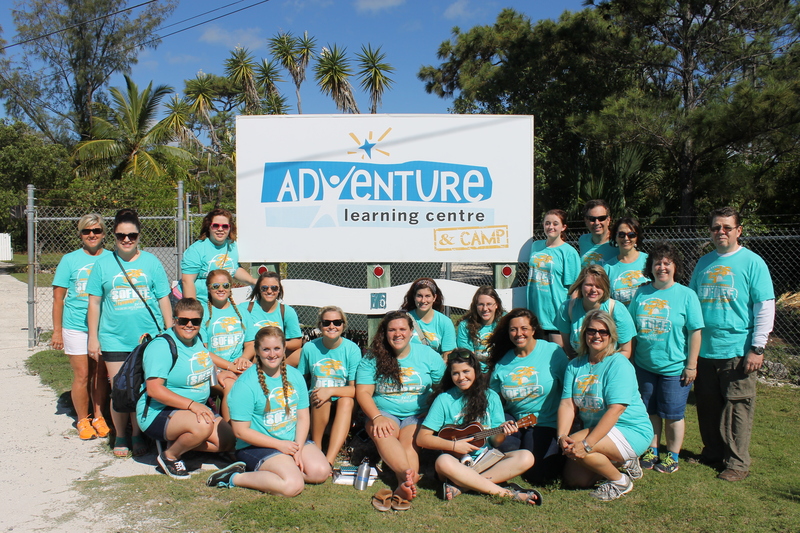 When we returned to the island on June 9th, LCCS was already on the island serving the Bahamian people. The team was comprised of a group of homeschool families ages 6 years to adults. They served at BAPD, ALC, and Children’s Emergency Hostel. This week we have been serving Mission Discovery. The leaders arrived at the end of last week and the team participants arrived on Sunday. The team is comprised of 2 churches, one from Atlanta, Ga and one from Rockford, IL. The teams have been serving at a Haitian Day Care and Pastor Exante’s church. Along with MD team 2, a small group of young men from Philadelphia have been with us this week. 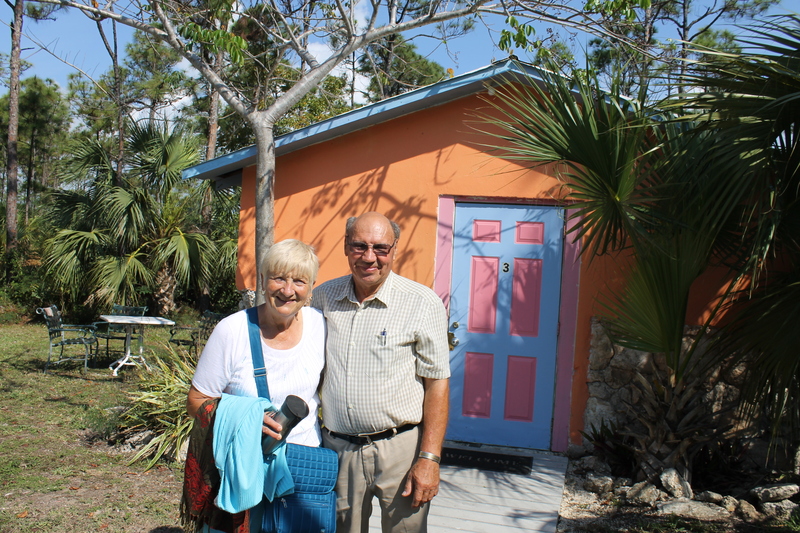 They have been on the island serving at the ALCamp in the mornings (they have done a lot of painting on the Camp office building), an orphanage in the afternoons, and at a couple churches on the island. Last Friday was the final Youth Outreach for the school year. We had over 50 young people, and the evening included time of fellowship, singing, awards, challenge from God’s Word and of course hot dogs and s’mores around the camp fire. Youth Outreach will begin again in September. For six weeks this summer, the Centre is hosting Day Camp for children ages 5-12. This year the children are going “Under the Sea”. It is an exciting time for 80+ young people and the staff. Activities include singing, Bible class, sports, crafts, horseback riding, train rides, beach days, and field trips. 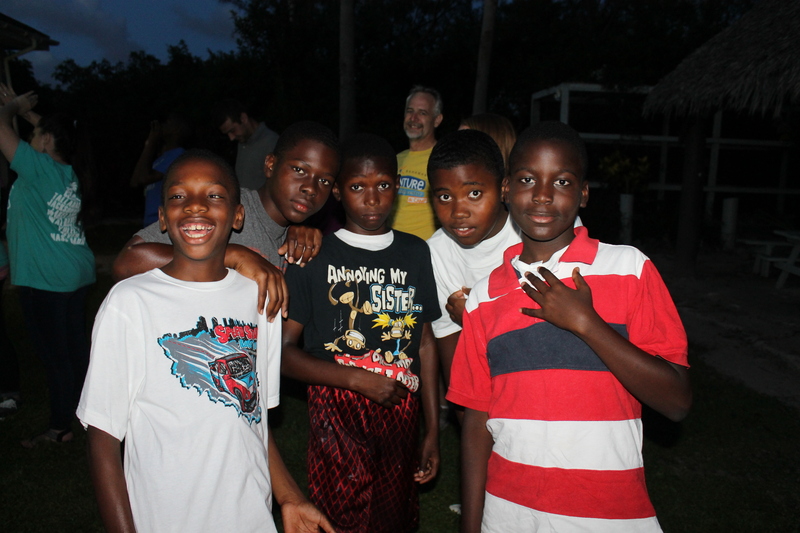 Please pray for the staff as they work with the children and endure the hot, summer Bahamian sun. Cabin 3 is currently staff housing but is slated to be removed to make way for a new cabin. Work on the new cabin is still not underway, but preparation and obtaining Ministry of Works plan approvals are underway. Instead of building a brand new cabin next to cabin 1 as we previously reported, the board has decided that we are going to tear down cabin 3 and build the new cabin in its place instead. Pray that God provides staff housing. With the removal of cabin 3 (currently used for staff housing), we are faced with some serious, inconvenient challenges for staff housing especially when large groups are here. The petting farm at the Centre has been receiving a facelift and has acquired some new animals. Teacup pigs and budgies are two of the most recent animal acquisitions. 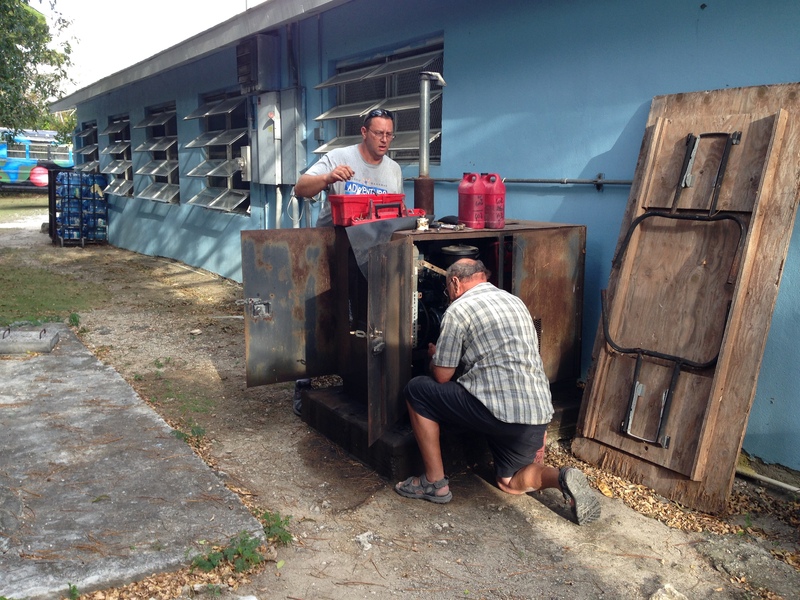 Praise the Lord for a new generator to run the dining hall/kitchen and bath house. It is installed and has already run a couple of times during power outages. Please continue to pray for us as we personally raise funds to buy a generator for our house (frequent power outages affect our ability to homeschool). Major changes are taking place. Earlier this week, ALC&C board chairman Lee Burtelson was on the island to meet with ALC&C staff and with Cranston Knowles, one of our other board members. During meetings, Mark Wallace stepped down as over-all director of the Centre side of the ALC&C ministry. Mark will continue to function as Science and Outreach Director. Dilan VanRyn is Programme Director. Jen Rogers is Curriculum Director. Sean Wilson is Animal Welfare Director. Tim remains Camp Director and is now Maintenance Director for both the Centre and Camp as well. Please pray as this added role increases Tim’s already full work load. As for over all leadership of the ALC&C ministry, please pray that God sends the right person to fill the role of Executive Director of ALC&C. Facilitator staff for next year is still needed. If you know a godly young man or woman who would like to come to the Bahamas to serve for a year, please let us know! We know some of you read our blogs to find out how we are doing personally. We are sorry, but for sake of time, we will not be able to update family news. With the current work load and the recent developments and changes, I (Mindy) am doing a lot more to assist Tim in the work he has to do. As time allows over the next couple weeks, we will try to update you on what is going on in our personal life. Thank you for your prayers, support and interest and in our lives and ministry work! Life is a story, and in a few short days, one chapter of our life’s story will end and another will begin as we gather at a La Crosse, Wisconsin park to witness the marriage of son number two to the young lady God has created perfectly for him. 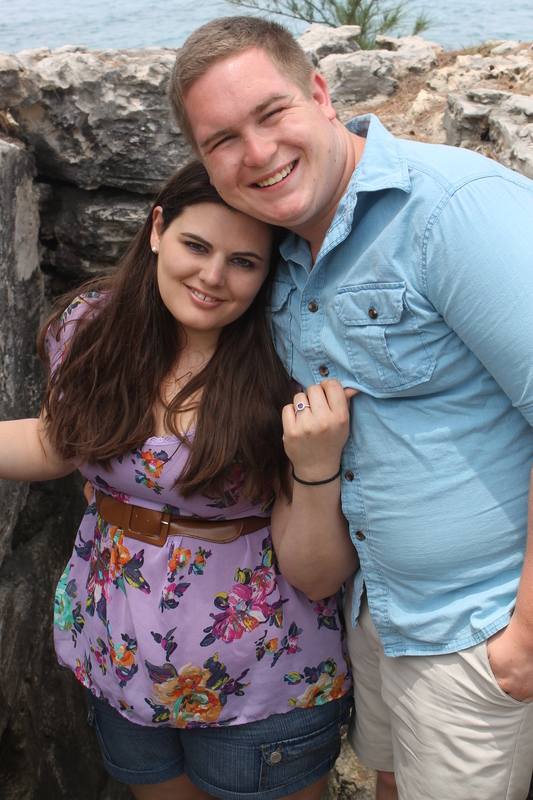 It is hard to believe a year has passed since we were announcing the exciting news of Garrett and Abigail’s engagement. You may recall that Garrett proposed to Abby on a Nassau beach last June while they were visiting us and attending Logan’s high school graduation. The year has flown by, and now we are about to welcome another daughter into our family. This past week, we were up at the north shore of Minnesota enjoying a few days of one-on-one time with Garrett. The days alone with our son were so sweet. We were able to share Garrett’s favorite pass time (hockey) with him as we visited the United States Hockey Hall of Fame in Eveleth, MN, enjoy hikes around Gooseberry Falls State Park and Split Rock Light House State Park, and visit Canal Park of Duluth, MN. Of course who can forget the delicious pie at the world famous “Betty’s Pies” of Two Harbors, MN. …arrived in very chilly, foggy Duluth. We had lunch at Grandma’s Saloon, and then toured Canal Park. After touring Canal Park, we drove north about an hour to Cove Point Lodge. Our hike around the resort brought us to these really cool Adirondack Chairs. …and Gooseberry Falls State Park. We had breath taking views of Lake Superior. The trip was short, but memories and final bonding time with our son were sweet. With the trip now over, we can begin focusing on the last few days of wedding preparations. To Garrett and Abigail: we are excited for you as you begin this next chapter of your life together and thereby usher us into the next chapter of our lives. We love you, support you, and pray that God blesses your union and guides you on your journey together. We love you both! To the rest of you: stay tuned for the next blog update. We are sure we will have wedding pictures to share! As we speak, a mission team with Mission Discovery is at Camp being served by the staff in our absence. 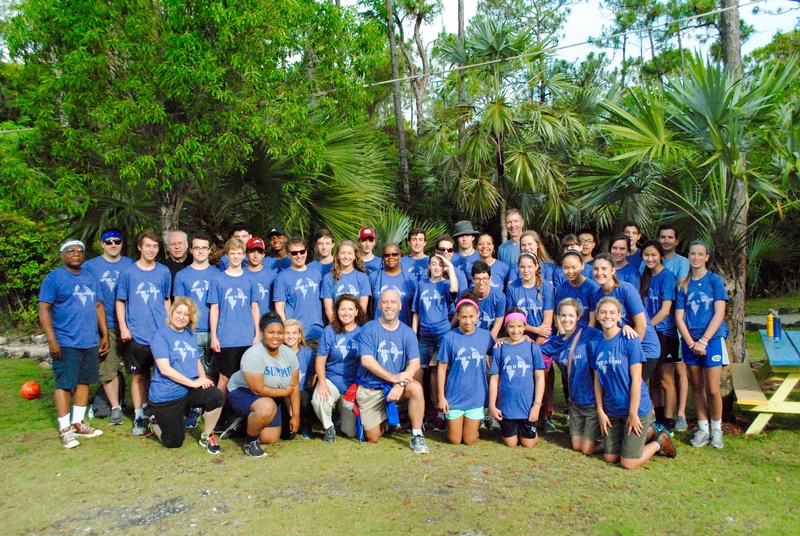 We hosted three mission teams in May. The young people from FAU did blood pressure screenings at the mall and served at Princess Margaret Hospital and Bahamas Association of Physically Disabled. 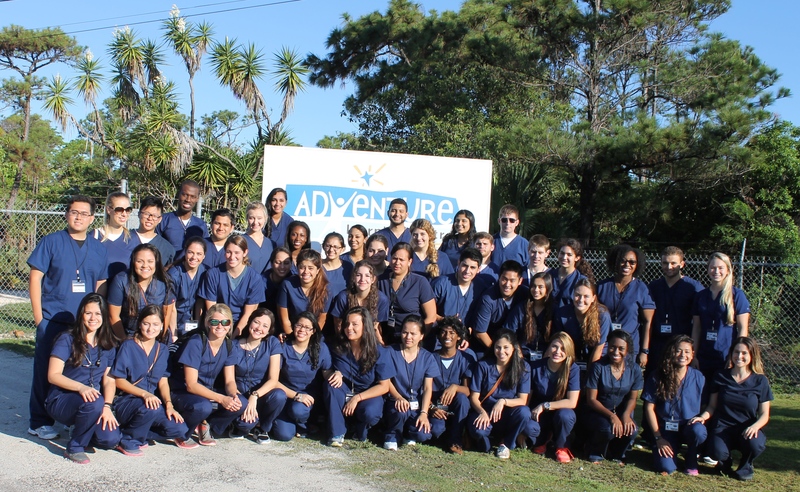 The team is comprised of college students that are a part of American Medical Student Association. 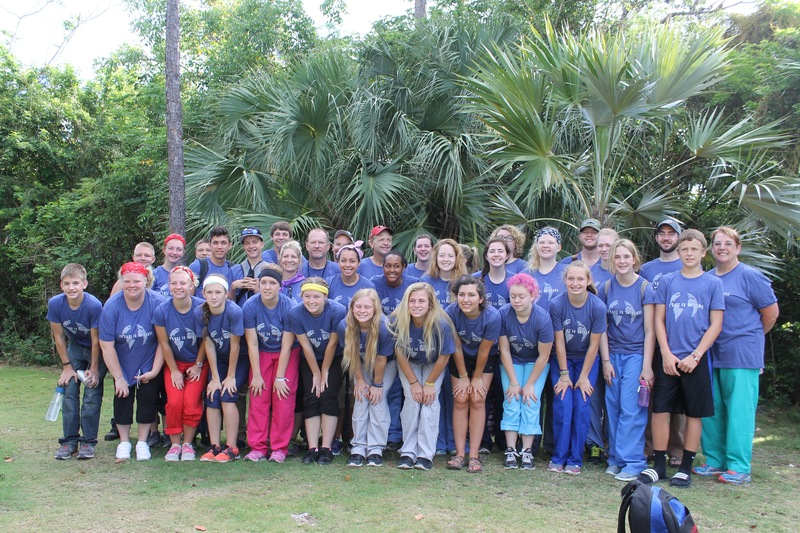 The mission team from the University of Mobile was a first of its kind for ALC&C. SoFree is a music ensemble that travels around to churches, schools, and other ministries sharing their beautiful musical talent. They ministered at Bahamas Association of the Physically Disabled, the Emergency Hostel, Camp’s Youth Night, Adventure Learning Centre, and Ebenezer Baptist Church. We were extremely blessed to have them in the Bahamas. The young adult group from Life Church in Richmond, VA was led by Vernon Gordon who had come back in February and stayed with us during a scouting trip. The team came for 5 days and worked hard serving the children at the Emergency Hostel and Bahamas Association of Physically Disabled. They also worked on projects at the ALC&C. Friday night Youth Outreach at Camp continues. We usually average about 10-20 young people a night, but a youth group from a local church joined us at Camp this last Friday and we had close to 50 young people. Praise the Lord! We have enjoyed getting to know the young people that come. Those that helps us with the outreach have done such a fantastic job. We are so thankful for their hard work and dedication. 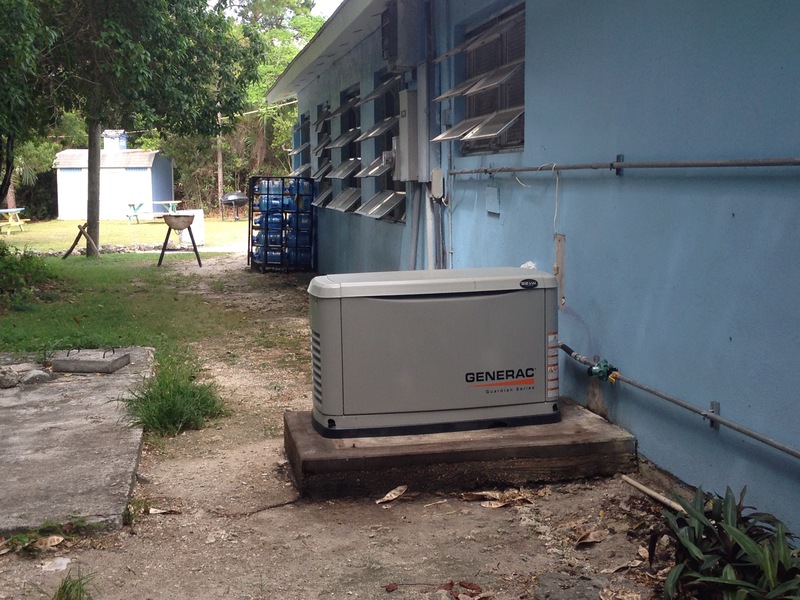 Thanks to a generous donor (you know who you are), we were able to purchase a generator to replace the one outside the dining hall that quit working earlier this year. If you follow our blogs and Facebook page, you know we have been having challenges with electricity. Power outages are random and frequent and without a generator, we struggle to do our work and serve our mission teams. Power is needed to operate the wells, keep the food refrigerated, and allow us to communicate with mission teams. The new generator will service the dining hall building and the well in the bath house. Work continues on plans for a new cabin. It is in the board’s hands now, but we hope to have the go ahead soon so we can start construction soon. The building that houses Tim’s office and a couple of apartments has been long in need of new siding. As with all wood products in our climate, the office siding has become victim to termites, carpenter ants and moisture. Thank you, Life Church (picture above) for all the work you did on the office building! Bob has been busy with other projects around Camp as well. We appreciate all the hard work he does. Not only is it hard work, it is hard work in high heat and humidity. Good-bye, Sam and Megan! Two of our short term missionary staff have left the island. Knowing these days would come did not make it any easier to say good-bye. These two young ladies added a lot to the ministry. We are so thankful for all they did to further the Kingdom of God. Eternity alone will tell the impact for the cause of Christ these two ladies have made in the Bahamas. Yes, we have had some sad good-byes, but we also have an introduction to make. We are pleased to introduce Denize to you. He is our new Camp Grounds Keeper. 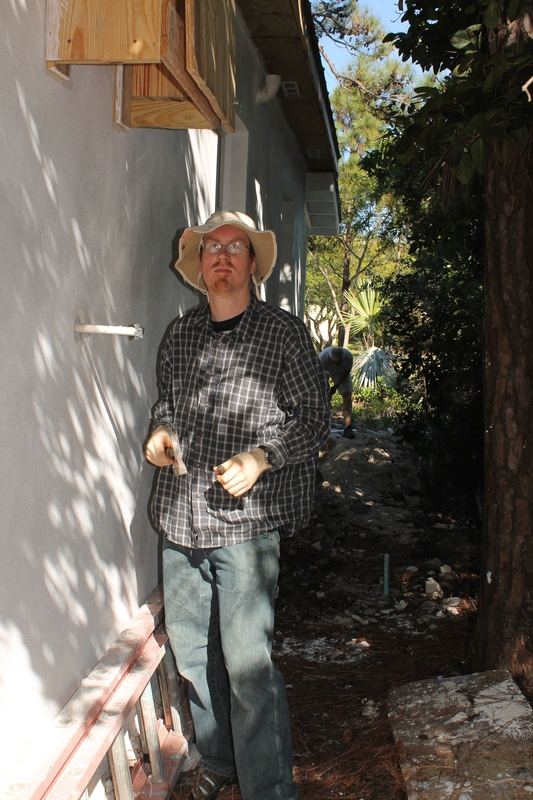 He has been doing a fantastic job and has such a good attitude and work ethic. Camp is beautiful, and we are thrilled to have him on board. You may recall that a friend of ours has come to Nassau on 3 occasions to test the waters to see if ministry at ALC&C would be a good fit for him. After much prayer and consideration, Aaron Mills has felt God is indeed calling him to join us at ALC&C and is now working towards that goal. Please pray with us for him as he makes plans and preparations. He will help with technical issues and maintenance projects. 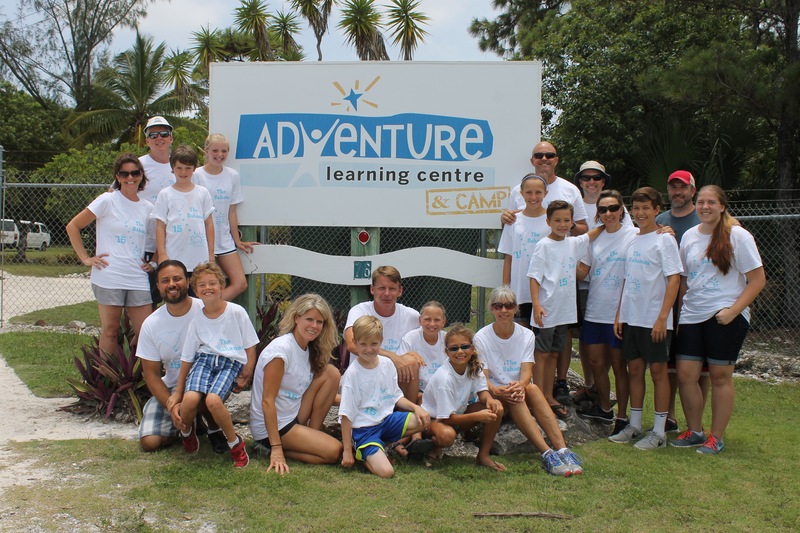 With Megan and Sam’s departure and the departure of a couple paid Bahamian staff, the Centre is in need of facilitator staff for next school year. If you or someone you know would like to serve the Lord for a year in the Bahamas, is able to work and share the love of Jesus and the Gospel with children, please let us know. We have just the place. The kiddos all tower over Mindy now. Tim is not in this picture because he had not yet arrived in Minnesota. Of course the biggest event in our lives right now is Garrett to Abby’s wedding. 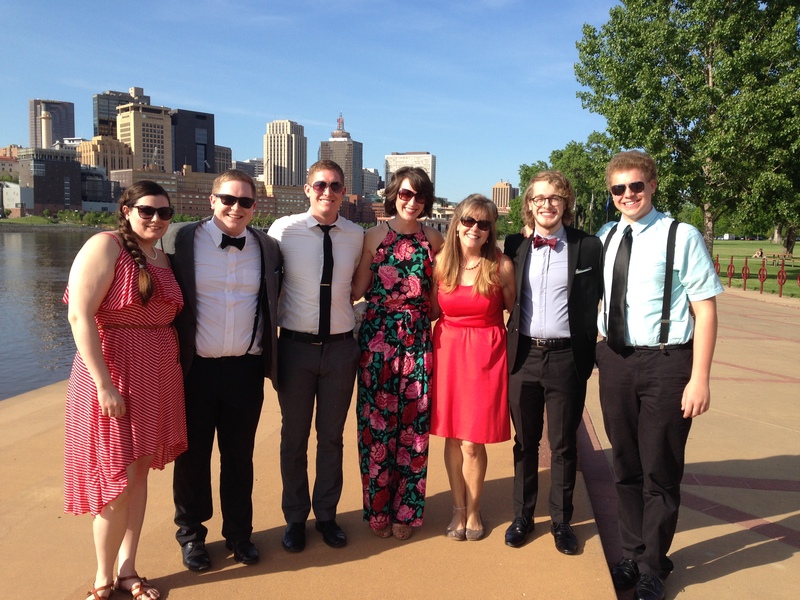 After they are married, they will live in Hutchinson, MN (1 1/2 hours west of the Twin Cities). Abby will continue her occupational therapy job, and Garrett will be looking for work in the area as well as preparing to restart college classes. Logan successfully completed his first year of college at University of Minnesota. He did very well and has been working in the IT department at University of Minnesota. He will be joining us in Nassau for nearly 3 weeks in August. We look forward to his visit. Zachary successfully completed his 11th grade year of high school (except a few more lessons in math) where he took several online college courses. He will be traveling to the US again later this summer where he will be working for Mindy’s parents for a couple weeks to help them put up wood for the winter. Andrew and Katie are doing well. Katie is finishing her first year as kindergarten teacher at Shannon Park Elementary School in Rosemount, MN, but will not be returning next year due to layoffs (system policy is last in/first out). We are praying that God leads her to the right position for next year. Andrew is in a new position at his job with Wells Fargo and works a lot of overtime. Tim has been very busy juggling many projects and leadership responsibilities and Mindy continues to assist him wherever he needs her. With Janice now at Camp to assist Judi with kitchen/housekeeping duties, Mindy’s role at Camp is in transition away from oversight of kitchen/housekeeping to more of a personal support and assistant to Tim. Things remain in flux, but with major changes and growing at the ministry, there is never a shortage of things to do both at home and at the ministry. Praise and Prayer Requests can be accessed on the tab above or simply click the link here. 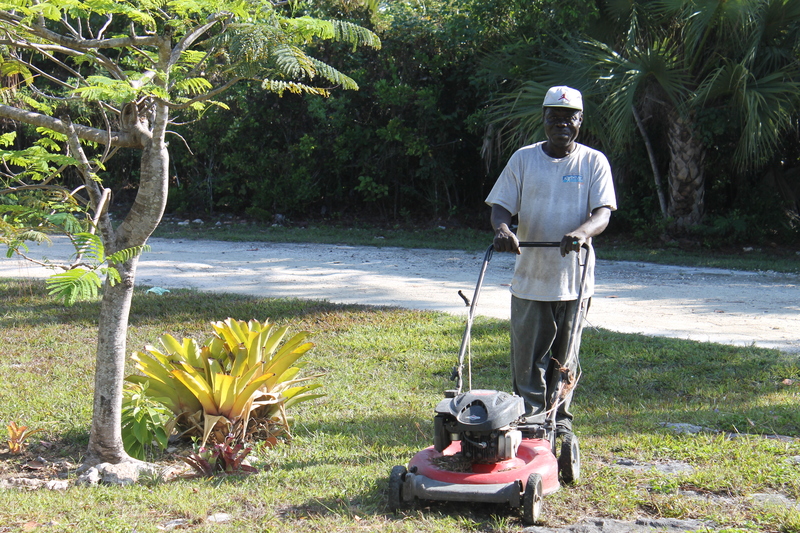 Don’t forget to check us out and “like” us on our Facebook page: The Seeley Family Serving in the Bahamas.